So, when I got up with the sun after 9 a.m. this morning, and still beat everyone else in the house to the punch, it was decided that today would be a non-video-game day. We figured that maybe we all needed a break from what we had been doing all week. At first, Noah erupted in an explosion of complaints. "Why?" he exclaimed, hitting that perfect combination between a kittens mewling, a donkey's bray, and fingernails on a chalkboard--otherwise known as whining. "I can't think of anything else to do! I can only think about video games!" "That's exactly the problem," said Jason. "You've played video games so much this week, you've forgotten how to play for real." Noah sulked on the couch in silence. Some time later, Jude, Noah and Jabin had pulled out a toy that's an oldie-but-goody around here--the MegaBloks racetrack. I normally keep it in the SeaCan, as it takes up quite a lot of space (for a toy), but with the amount of small babies that we've been entertaining lately (along with their families, of course), I figured it might be a good idea to bring it and its extra-large, baby-safe components into the house for the holidays. This toy was a gift to our kids from their Grandma Winters when Jude was about 3. It has, apparently, yet to lose its appeal. 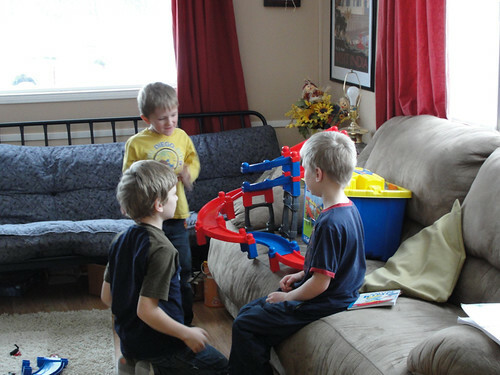 After being heavily involved in setting up the track at the highest location possible and shooting cars across the living room from it for about ten minutes, Noah suddenly rushed over to Jason and exclaimed, "Dad! I'm not thinking about video games!" then ran back to play some more. Jason and I, needless to say, found the situation (and all its attendant irony) completely hilarious! Looks like they were having TONS of fun.....irony and all!